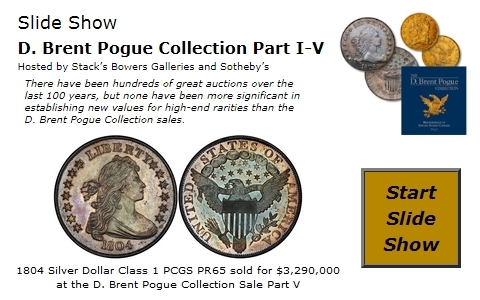 Dealer Subscribers also get full access to ALL of our Online and Mobile Price Guides: Market, FMV, PCGS, NGC, CAC, & Plus+ Prices. Subscribers will receive the current password and user name for full access, via email, usually within one working hour. A new monthly password and user name will be sent via E-news at the beginning of each month and can also be found on the back page of the weekly Dealer Price Guides. 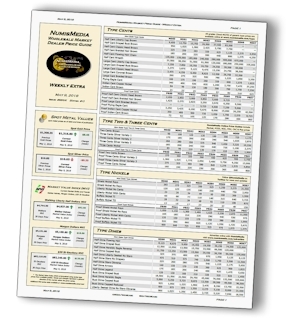 Now included for all NumisMedia Dealer Subscribers and Members, the NumisMedia Weekly Extra Wholesale Market Dealer Price Guide, in PDF format. 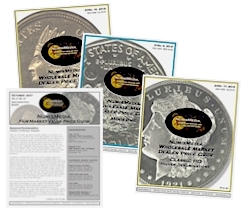 The NumisMedia Monthly covers the most traded series and represents our Fair Market Value determination for a properly graded coin. 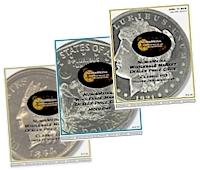 The pricing information we report comes from all over the numismatic market, from reliable dealers known for their unbiased market knowledge. Collector Subscribers also gain online access to FMV, CAC�and�Plus+ prices; the current password and user name will be sent via email, usually within one working hour. A new monthly password and user name will be available in the next Monthly FMV Price Guide. 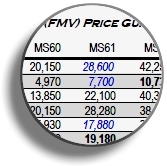 The NumisMedia Online FMV Price Guide (all grades, Good thru MS70) is FREE to all visitors and does not require a password. 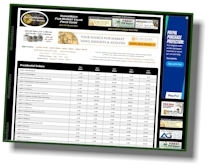 The FMV Price Guide is the most visited area of NumisMedia.com. For credit card payments by fax or phone (Visa & MC only) include card info, full name and billing address of�card.